Home » How many calories in a teaspoon of sugar? Are you wondering how many calories there is in a teaspoon of sugar? The answer is 16 calories, according to the Nutrient Database for Standard Reference provided by the U.S. Department of Agriculture (USDA). With the amount of sugar added in every type of food we consume, it is wise to keep count of calories to maintain a healthy weight. It is recommended that you consume about 100 to 150 calories of added sugars every day. Any more than that might not be unhealthy, but it can lead to an increased risk of obesity and heart disease. For this very reason, you should be aware of the number of calories in a teaspoon of sugar so that you can learn to keep count of the calories you are consuming every day. To easily calculate the amount of calories per teaspoon you can of course just multiply the amount of teaspoons with 16 calories. This will give you a quite accurate estimate of the amount of calories. However, if you want an exact number, which you could even include as reference to any project you are working on, then take a look at the table below showing the amount of calories per teaspoon of sugar as the tsp intake increase. The data is collected from the Nutrient Database for Standard Reference – USDA. Ok, so now you know how many calories there is in a teaspoon. But what happens when you mix sugar with liquids? For example, how many calories does a teaspoon of sugar have after it is mixed with water? Well, the number of calories in a tsp of sugar mixed in pure water will always have 16 calories. However, when sugar is dissolved in liquids that already have added sugars, the total calorie count would obviously account for more than just sixteen. Many drinks are therefore not as healthy as you think as they may have a lot of added substances that increases the total calorie count. The calories in one teaspoon of sugar can vary slightly depending on the manufacture of the spoon, but also on how much you scoop up. Using a measuring spoon would be a good way to get the exact quantity of sugar a teaspoon actually has, which is particularly useful when you are baking. When we add sugar to tea or coffee we might not really reflect on how much sugar we scoop up. What is one teaspoon for you may actually be two “real” teaspoons, which would mean you are actually consuming more calories than you thought. A normal teaspoon of sugar vs a heaped teaspoon of sugar. 1. Many products list energy in terms of kcal or kJ, but how do you measure the calories from just sugar? To understand how to measure sugar calories per teaspoon in products , you must know that one tea spoon of sugar is equivalent to roughly 4 grams of sugar. Read the nutrition facts label from the product and read the grams of sugar written on the wrapper. Since there are sixteen calories in one teaspoon of sugar, it means that there are sixteen calories in four grams of sugar. The math is pretty simple from here on, all you need to do is multiply the number of grams on the wrapper by sixteen and divide by four, and you’ve got your answer! Remember, that you are just calculating the amount of calories that is coming from sugar and not the whole product. 2. How many calories is there in half a teaspoon of sugar? The calories in half a teaspoon of sugar would account for 8 calories. 3. How many calories does a heaped teaspoon of sugar have? 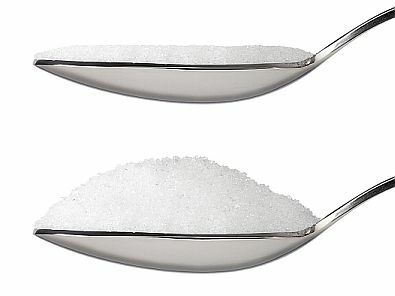 The amount of calories in a heaped teaspoon of sugar is around 2 teaspoons. 4. How many teaspoons of sugar can I consume per day? According to the American Heart Association, it is recommended not to consume more than 6 to 9 teaspoons of added sugars per day.